Passover is a week long holiday with food restrictions, which can seem daunting to many home cooks. After all, the prospect of seven straight days of matzo doesn’t exactly excite one’s inner gourmet. Believe it or not, I look forward to the challenge of coming up with simple tasty dishes that work for the holiday and my family’s tastebuds. When Tropicana approached me to explore their Passover-certified juice line and come up with a tasty recipe, I was game to give it a go. My family loves a glass of orange juice at breakfast all year round. 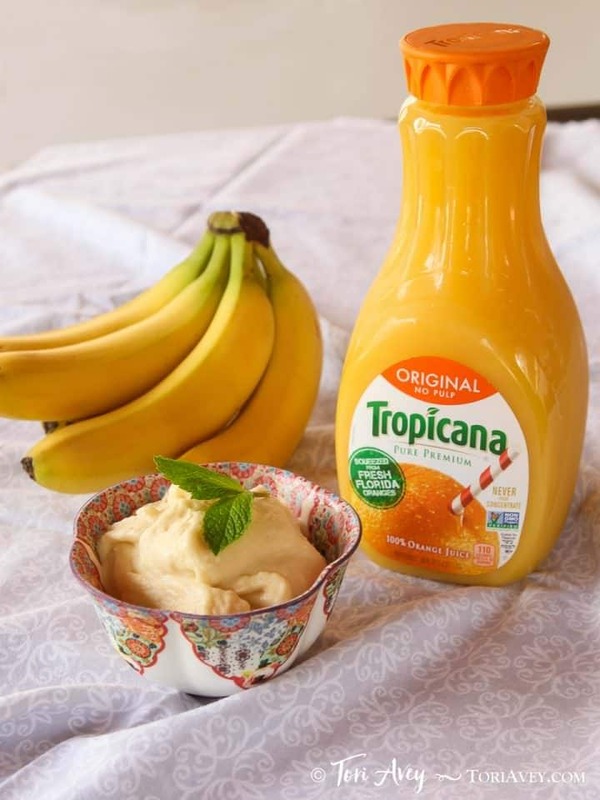 Tropicana Pure Premium has been certified Kosher for Passover for 25 years, and is available in five flavors, including No Pulp, Some Pulp, Lots of Pulp, Calcium, and Calcium Lots of Pulp. So whether you like no pulp, or lots of it, you’re covered! And best of all, Tropicana at Passover tastes just the same as it does the rest of the year. Use it in recipes or alongside a stack of bubaleh or matzo brei and enjoy! 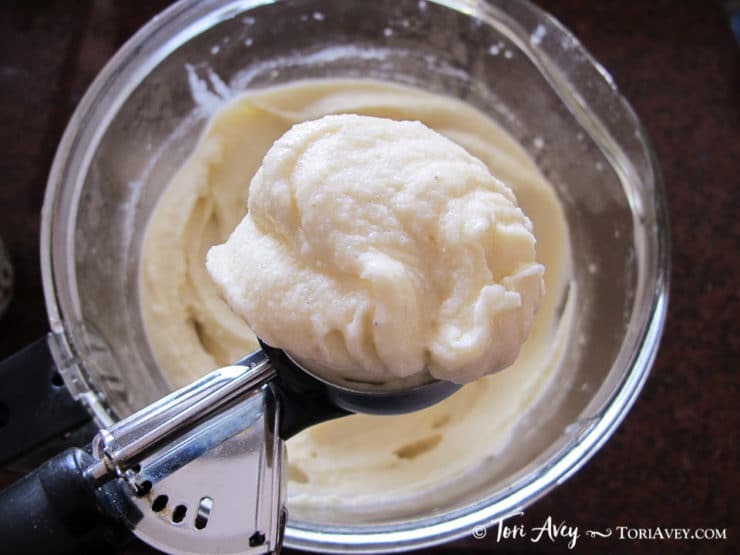 This ultra-simple food processor sorbet recipe can be made with just two ingredients (seriously!). After a little advanced prep work and some time in the freezer, it takes less than 5 minutes to prepare. The best part? This all-natural, healthy and simple dessert contains no added sugar. Tropicana Pure Premium orange juice is 100% juice with no added sweetener. 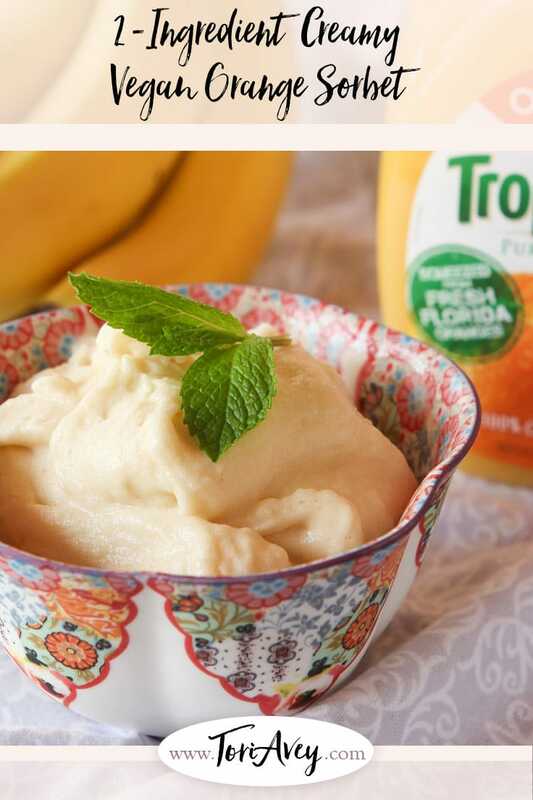 When the juice cubes are blended with frozen bananas, it creates a creamy, dreamy sorbet without any added dairy. Add a little vanilla and ginger powder to enhance the flavor, or leave it au naturel – it’s tasty all on its own, too! This would be as much at home on a Seder dessert plate as it would be in your mid-week dessert bowl. A no-guilt Passover treat, with no matzo required… how great is that? Follow Tropicana Pure Premium on Facebook, Twitter and Instagram. Sponsored by Tropicana Pure Premium. All opinions and ideas expressed here are my own. Thank you for supporting my sponsors, they allow me to share more free recipes, cooking tutorials, holiday crafts and food history with you. 2-Ingredient creamy vegan orange sorbet – super easy, healthy and dairy-free Passover dessert. 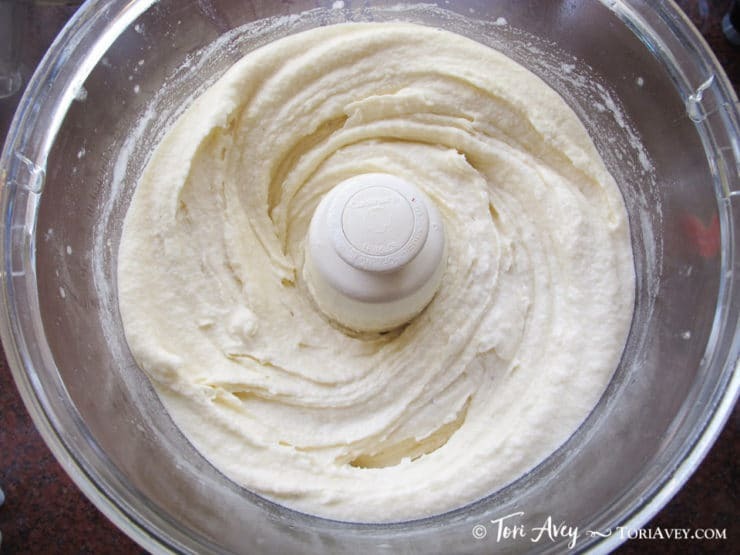 Note: If your food processor is on the small side, you may wish to process one batch at a time so that you don’t overwhelm your processor. 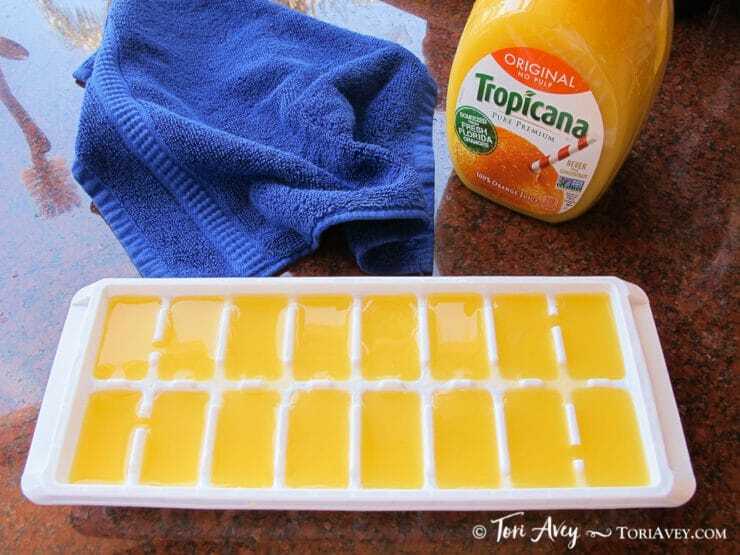 At least 8 hours before, fill your ice cube trays with orange juice and freeze until solid. Cover a sheet tray with wax paper. 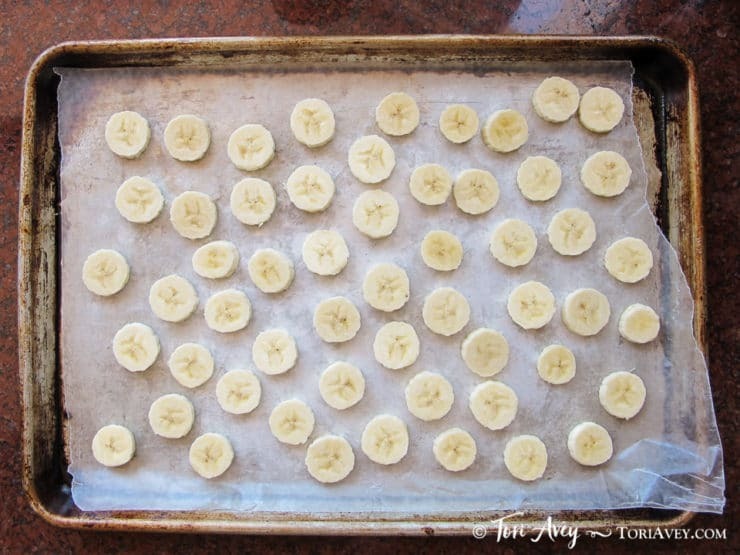 Slice the bananas and lay them flat on the tray. Freeze for at least 8 hours. 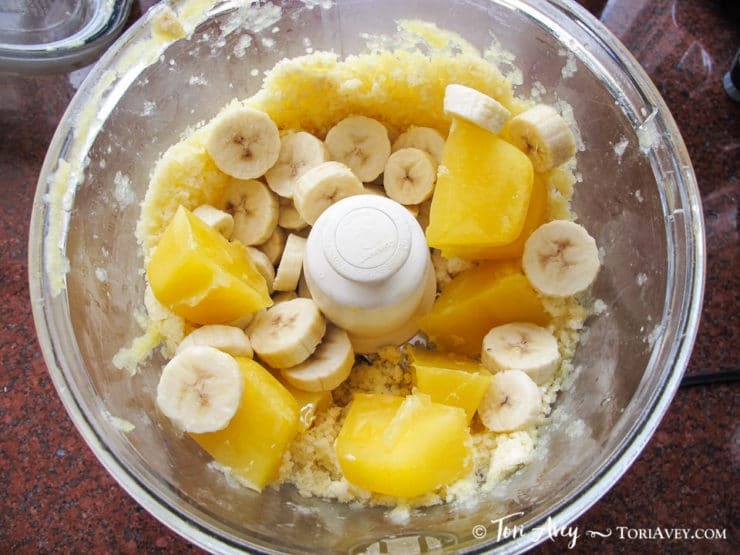 In your food processor, start with half of the frozen orange juice cubes and half of the frozen banana slices. Pulse to process until it becomes thin crumbles. Then add the remaining orange cubes and slices. Continue to process, scraping down the sides and stirring as needed until the mixture becomes creamy and sorbet-like. This will take a few minutes. If desired, add vanilla and ginger. Once it becomes creamy, be sure to stop. If you over-process, the heat will start to melt the sorbet. Serve immediately or transfer to an airtight container and freeze until solid. If you eat it immediately it will have a soft serve texture; freezing for a longer period of time will harden the sorbet and make it more ice cream-like. Garnish with fresh mint when you serve for a pretty presentation, if desired. Wonderful and Easy, thank a lot!! Would you tell me if I could use fresh orange sections instead of juice to make the sorbet? We’ve made berry sorbet and used a simple sugar syrup and the berries. I wonder if fresh orange sections and the banana with perhaps a couple tablespoons simple syrup with almond extract and cinnamon would work?? You can certainly add fresh orange sections, but you will need some kind of liquid as well in order to obtain a smooth blend. Wow, I’m definitely having one of those “Why hadn’t I thought of this before” moments! We’ve tried this now with 3 or 4 different juices and even chocolate milk (not vegan, but still delicious) and it completely holds up. Thanks so much! Thank you Tori. 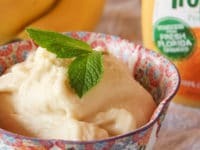 Love Sorbet and I’m sharing this with your link. 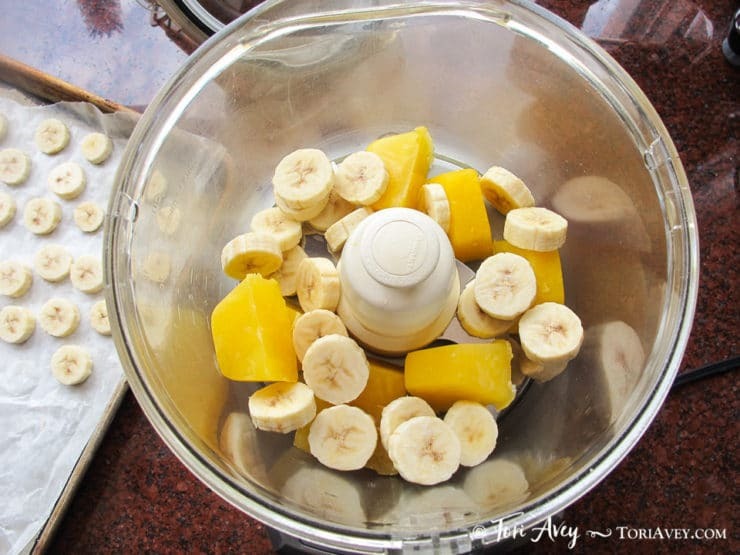 I have one of those freezer-ice cream maker units where you freeze the drum, so I am going to make this by blending the juice and bananas and pouring into the drum and churning. I think it should work well, although I like the freeze/process idea also. OMGosh! I’m so sharing this!!! While I love OJ I’m not a big fan of all that sugar, so I will give this a try in the vitamix with a whole orange and some unsweetened vanilla almond milk. 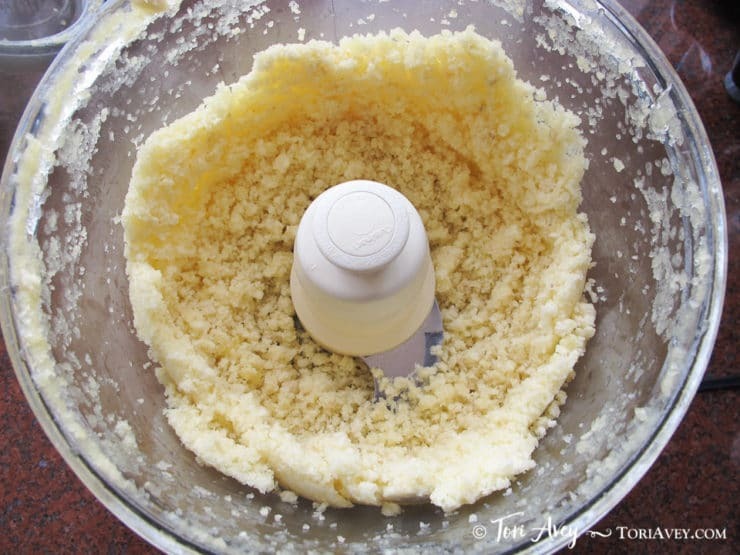 I don’t have a food processor, or a blender. Any ideas to make with just old fashioned elbow grease? 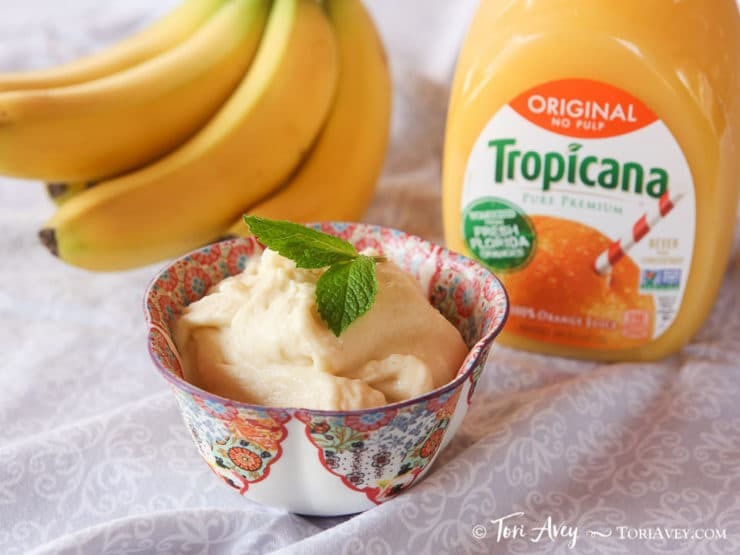 Andrea and Tori, probably could mash bananas with a fork and add the juice to them in a bowl and freeze for a while, take it out and stir it really good and keep freezing and stirring until it is blended and frozen. Yet anothe r something to make when we are so very limited! Sounds like a keeper! Tori, this sorbet looks so delicious and so refreshing. I have never made sorbet before, but I will give yours a try. Do you think I can make it say with guava juice? I love the bowl in which it is displayed also. With what Tori said, I would think you could do mango, lime, lemon…but probably not pineapple.